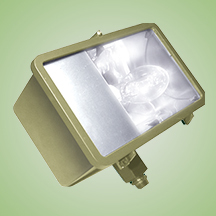 The SRF-BR Flood Light is a compact HID light ideal for site, display, landscape, and general security lighting. Designed specifically for lighting small trees with medium canopies. The brass housing makes this fixture ideal for harsh or coastal environments. A number of shielding options are available for customized effects. The housing and door frame are constructed of die cast brass. The flat tempered glass lens is sealed in place and a door gasket is provided for weather tight protection. ETL listed for wet locations. Available in 50W thru 100W pulse-start metal halide, high pressure sodium and mercury vapor. Comes standard with a 4KV pulse rated medium base socket. Each 60HZ CWA Multi-Tap1 or 480V ballast is pre-wired and installed for convenience.